We have seasons in Tanzania; but our seasons are different than those in the states. First, we have weather seasons:we basically have the rainy season and the dry season. However, there are other “seasons” that are marked by bugs and insects. For instance, there is a time when the safari ants are on the move, there is a time when termites hatch out, there are times when the ants invade the house, their is a time for dragon flies, lake flies, etc. When these “insect seasons” come they come with a vengeance and for a day or two the insect of the hour/day is available in abundance; some are more annoying than others. My least favorite are the lake flies (tiny and they come in through the tiny holes in the screens) and the safari ants that can invade the house and move like an army across the property-and they bite. This week has been the season for the grasshoppers; huge (bigger than my thumb) and green. At night they cover the outside of our window screens although they are scarce during the day. Our four workers love the grasshopper season; seems the grasshoppers are quite tasty when you remove their wings and legs and fry them in hot oil. 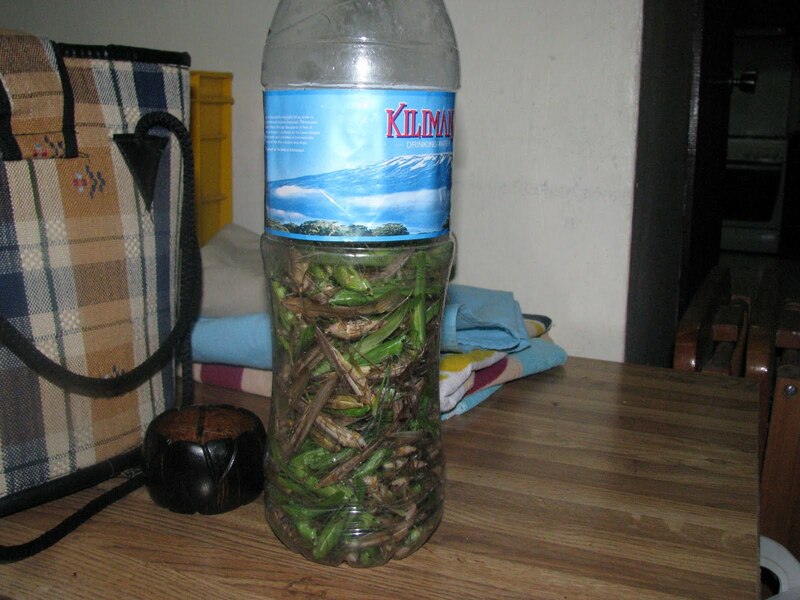 So, for the past few nights/days our workers have gathered grasshoppers in empty containers to take home for their families to eat. The above picture is an empty plastic water bottle (2 litre size) that our worker used to gather grasshoppers in to take home with her. They have all graciously offered to “fry me up some” but I have declined this particular cultural experience. you can learn more about grasshoper when you visit Bukoba(Tanzania) town from October to December every year.It's important season in our traditional.I like your story.